Stemming from the wild mind of Jeremy Murray, EBCo was BMX to our tight Eugene, Oregon crew. The 'E' stood for Eternal, not Eugene as some had thought. And the 'BCo' for Bike and Company respectively. When I purchased my first car, an '86 Accord, I knew I had to rock some vanity plates. Being heavy influenced by BMX, I decided to rep the local brand. Ironically I never made an attempt to take the license test and rarely drove the car, only via my permit and a friend. But fear not, my Dad (Hammy B) used the car regularly, making sure the plates made their rounds through town. 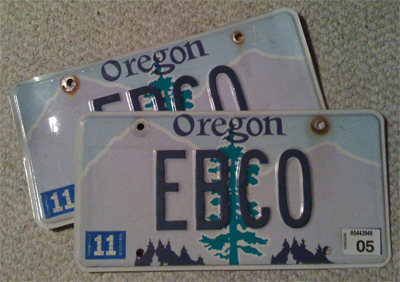 EBCo...that names stands for countless good times and friends, and I'm greatful to have been a part of it while it lasted.